Though there are many deities, these can be generally considered as falling under the broad classification of Saiva and Vaishnava. Between Siva and Vishnu, he may thought about which to choose. 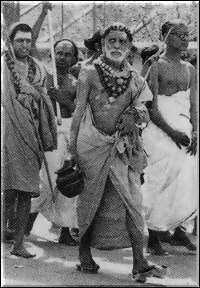 The Acharya was himself an Avatara of Siva. So, he may have thought – why use my own Name. Siva is very dear to Vishnu. In between, I mentioned the word Iswara. Though Iswara is commonly equated with Siva, in the Vedanta Sastra, Iswara is Sagnuna-brahman. Ramanujacharya and Madhwacharya also have used the word Iswara in this sense only. The Acharya has composed many stotras on Siva, like Sivananda Lahiri. It may be asked whether in those stotras he was doing stuthi of himself. They are bhakthi stuthis. Different sects and communities of people have their own likes and preferences among the deities. In order to be helpful to one and all in concentrating and steadying their mind in the worship of their preferred God, the Acharya composed stuthis on all the deities. How could he have left the important deity Siva? So, he composed stuthis on Siva also.